Think back to college days when money was nonexistent and healthy food was something only found in textbooks. We raided every cafeteria and fast food joint in town for napkins, plastic silverware and assorted condiment packages, know which ones had the best of each. Funny how we always had plenty of plastic red cups though. We are now a day away from our actual move, everything is in boxes including all silverware and my cloth napkins. I'm tempted to relive those college days of hoarding silverware packs and napkins from restaurants; my strive to be green is tested but wins out as I rip the tape off the box marked kitchen #15 to retrieve a couple of forks and knives. And aside from Chinese mustard there isn't a food in a condiment package I eat. But that leaves me to question what can I make that doesn't involve me unpacking a lot of pans and utensils? I want to have something that is pre-made that I can just grab and go. Something fresh and healthy but hearty to keep us strong for the move but isn't nasty take-out food. Overnight refrigerator oatmeal isn't an original Fat and Happy creation, but I really do like the variations and flavors I've come up with. 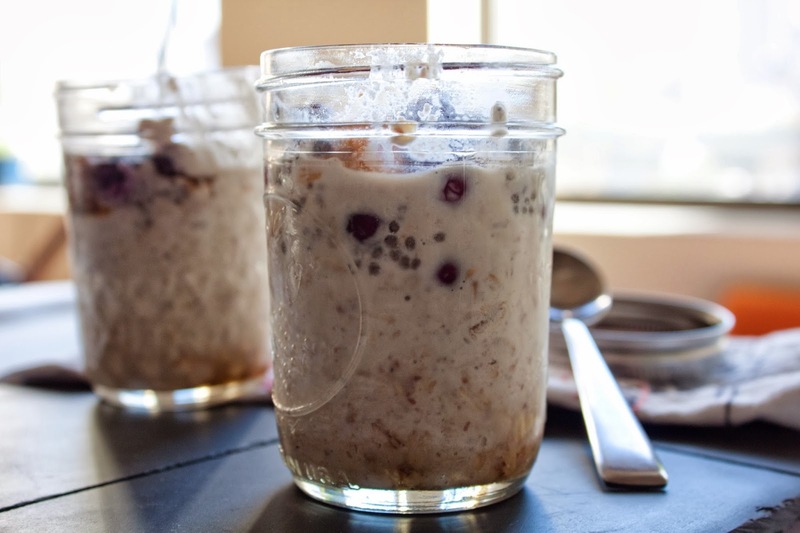 It lasts in the fridge for a few days and doesn't require perishable food. 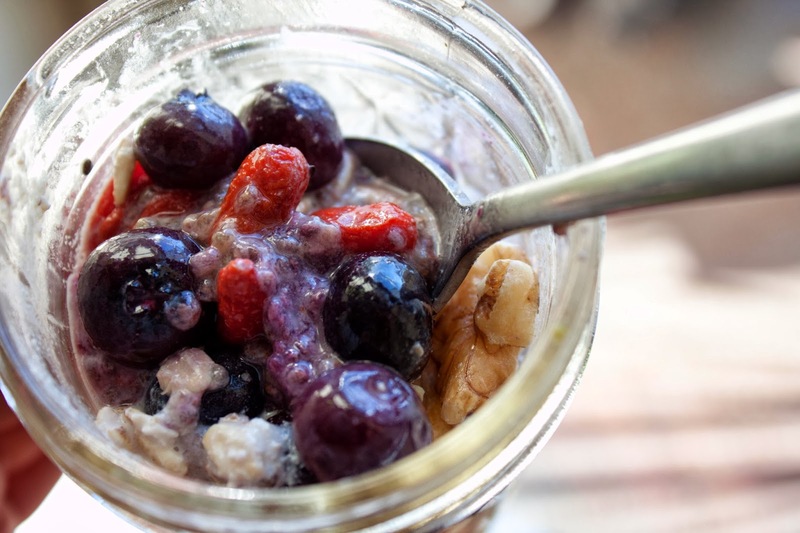 Just some oatmeal, a few nuts and some fixings like frozen berries and chia seeds. Drop it all in a jar, screw on the lid and let it do its thing. Grab one out of the fridge for an easy ready made meal or snack. Both the Blue and Goji Berry Vanilla Oatmeal and Cranberry Pumpkin Oatmeal turned out stunning for me. You could make hundreds of versions by varying the ingredients of fruit, nuts, seeds, milk or coconut flakes; they all offer endless possibilities. This is an easy recipe to add super foods like goji berries, chia seeds, maca powder, cocao and more. Use frozen fruit because it offers extra juice as it defrosts. These are great recipes whether you are moving or not. Imaging throwing one in your bag for after a work out or as breakfast on the go; you can eat them chilled or warm them slightly. They are pretty cheap on the pocketbook and if you're a clean eater you may not even need a napkin. You will, however, need a spoon; but you know where to get that. We are two weeks out from closing on our new place and moving. Luckily our current place is under-contract allowing us to start the packing process. Two entirely full truckloads went to donation. It was time to let go of the heavy bag I've been carting around for the past 10 years; there hasn't been a spot to hang it in our last two homes and there isn't a spot in the new place either. It was also finally time to let go of the thousands of cards and letter from friends and family through the years, but not without an entire afternoon of skimming through each one. That day was bittersweet- such warm memories relived but sad to realize these special communications are nearly extinct due to social media and smart phones. Stacks of boxes are beginning to demand attention as are all the final details like setting up new insurance and filling out an official change of address with the US Post Office (it is worth the $1 charge to do this online!) and getting new internet ready (our address is new and nobody wants to service this new location.) Nothing is ever as easy as it seems. Through all of this, all I can think of is how long can I keep my kitchen intact?? For most it is the last to get packed and the first to get unpacked. But even with that plan in place, there is quite a bit of kitchen pre-packing needed because I have an unusual amount of kitchens trinkets. I'm not a pack rat or a hoarder, but I do love collecting little kitchen dishes, interesting utensils, and old-world cooking vessels. Partially for photography sake ... mostly because I'm just drawn towards kitchen character. Packing is underway, cooking classes are on hold and I've resolved to live in a minimalist kitchen for the next few weeks. This got me thinking about what really are the bare essential, key items one needs to outfit a kitchen? Do I really need to own a whisk, an old school manual hand beater (who even remembers these? ), a hand electric beater, an immersion blender, three upright blenders and a stand mixer? Operation 'Kitchen Pare Down' is underway. Today I begin to the painful process of deciding which utensils and pans make the cut, already knowing some of my favorite indulgent items won't make it. There are a few obvious items already in the 'stay' pile: a chefs knife, a paring knife, measuring cups and spoons; for the remainder I've devised a system. I'm putting EVERYTHING from the kitchen into boxes. I'll remove the items I need to cook with over the next four weeks, everything left in the box at the end of the month isn't really needed. Probably. Maybe. I'll post the final list here and you can all weigh in. In the mean time, moving also means cleaning out the freezer. I save all my kitchen scraps for broth and have amassed two large bags full so it was time to make homemade broth. 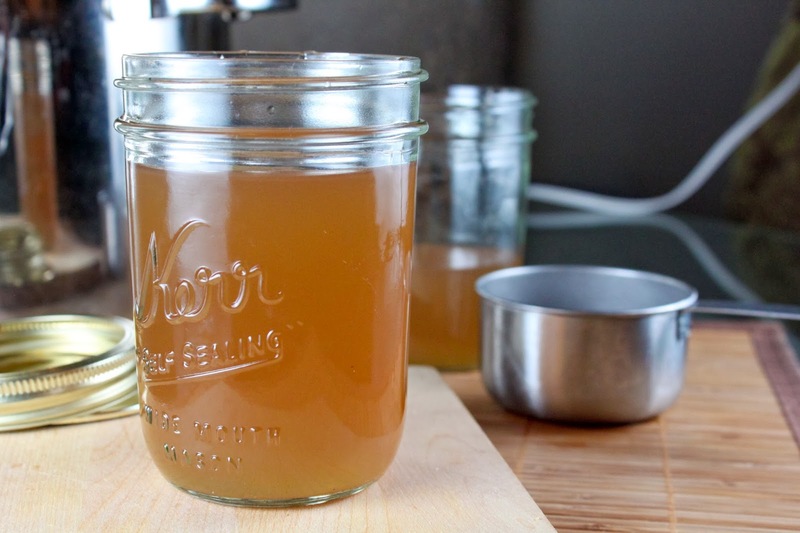 Broth is simple, easy and delicious way to use up vegetables. Side note: I took a strainer and large pot out of the boxes to make this. Below is my basic broth recipe, this is a super flexible guideline only, adjust with what you have available. Once you have this made, use it in soups and sauces and definitely cook all your grains in it. 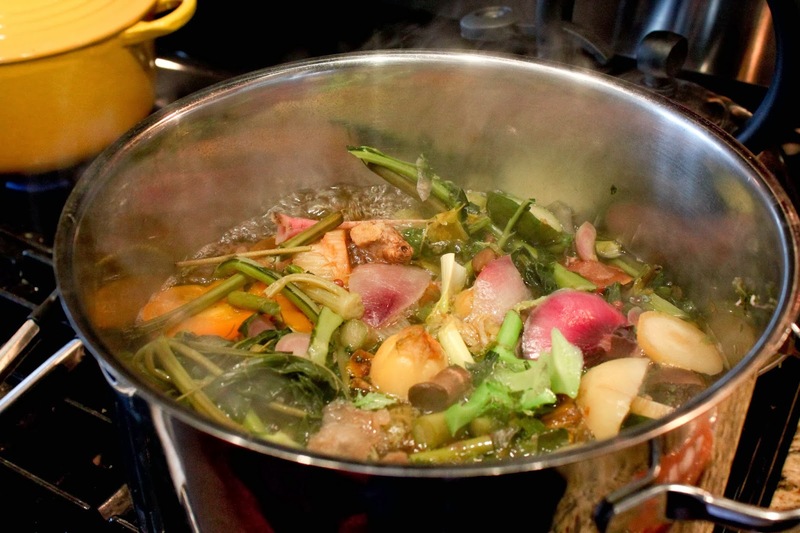 It's a great way to get extra flavor and nutrition without added calories or fat in your Fat and Happy dishes. Ever wonder who the first person was that decided to carve a pumpkin? And who thought eating that hard gourd was even possible? Lucky for us that person (or persons) were inquisitive as we now reap the benefits. 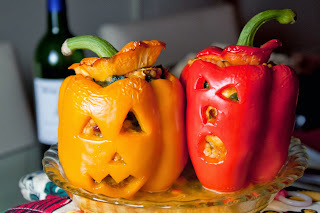 Since pumpkins are synonymous with Halloween I thought we should carry that theme even further into the kitchen with these adorable, delicious stuffed, decorated peppers. The couscous choice was merely one made based on our upcoming move (the more pantry items we eat, the less we have to pack and move.) Substitute in rice, quinoa or other grain of your choice. After baking, the slightly wilted pepper mixes with the pumpkin, the chorizo, the creamy goat cheese and the tart dried cranberries for a glorious spooky bite. I've roasted a lot of pumpkins but only recently heard that you don't have to scoop out the insides before roasting, but rather leave the insides in tact and scoop out after roasting. This made me curious so I did a little experiment by roasting half of the pumpkin cleaned out and half not cleaned out. The results were pretty much the the same, a dreamy creamy roasted pumpkin; though I found I preferred cleaning out the pumpkin first, maybe just for nostalgia sake. Say Boo at your next dinner with these super fun Fat and Happy stuffed pumpkins! Bruschetta is nothing more than a good piece of bread acting as a vessel for some yummy toppings. You almost can't go wrong with any combination you put together. Today I pair the long awaited butternut squash with a light radish and pea shoot salad for a lovely Summer meets Fall version. Rounding out the flavors is the orange parsley dressing. It's light yet hearty, soft and crunchy all in one bite. Delicious. 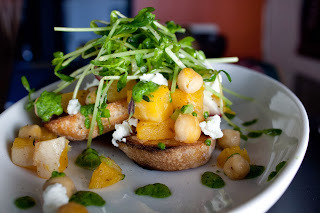 This is definitely a 'use a fork and knife' brushetta over a simple 'pick it up and take a bite' one and that just adds to the dishs' depth and character. Try this out as a plated appetizer or salad course at your next dinner party- you'll get some well deserved Fat and Happy kudos!